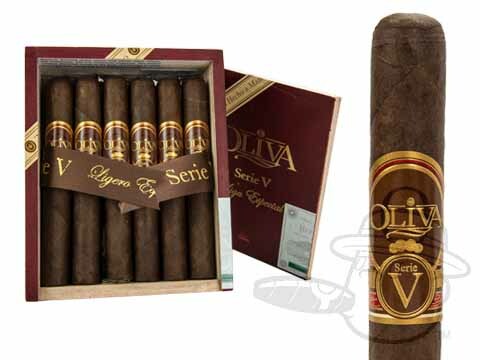 With a 94-percent rating from Cigar Aficionado, Serie V is Oliva Cigar Co.s most highly-rated blend, and rightfully so. These powerful yet smooth stogies are made with an oily, sun-grown Habano wrapper, along with ligero filler leaves from the Jalapa Valley, which have been carefully fermented to perfection. The result is a spicy, woody smoke with notes of red pepper, cedar, leather, and a hint of caramel sweetness on the retrohale. Available in countless sizes including their newest addition, the petit-corona-sized No. 4, Serie V is a smoke that any lover of full-bodied cigars would be foolish to pass up. Great cigar for the price. I like to think of the No. 4 as being the perfect "I'm going to take the dog for a walk" cigar. And being a Serie V, you know it tastes great. With this smaller cigar, I don't really enjoy the full flavor profile I'm used to with other Vs. This is still a decent smoke. I love this small but powerful, rich smoke. A wonderful winter cigar for those of us smoking outside. All the satisfaction in 30 minutes. Love the size, draw and flavor profile of this V. Great draw and even though not as powerful as the larger ring V's it delivers an enjoyable time out. Very pleasant tasting cigar, great even burning, and slow release. Oliva Serie V No. 4 is rated 4.7 out of 5 based on 8 customer ratings.